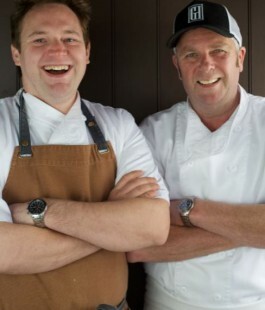 Chefs David and Jordan are part of the Flights of Chardonnay CRU on Friday, July 20th. Chef David Watt’s “modern Canadian cuisine” celebrates the ethnic diversity of Canada. His plates and menus feature an exciting range of flavours influenced by the cuisine of Asia, Italy and France. The passion, innovation and adventurous spirit burst forth from every plate! Chef David Watt’s culinary career spans more than 23 years. David’s career began with an apprenticeship at London’s famed Ritz Hotel following his schooling at England’s Cornwall Technical Institute. David was also Executive Chef on Holland America’s Windstar Cruise Line, sailing from Athens to Istanbul. Jordan Ellison is a Toronto born chef whose introduction to cooking was through his Northern British grandparents. After developing his cooking foundations through George Brown College’s culinary program in 2004, he started his career by working up in the brigade in the 360 Restaurant at the CN Tower, cooking for up to 1,000 guests per day and working with people from all over the world. Collaborating with such a diverse team is where Jordan’s interest for the cuisines of Asia began to grow. Jordan’s time spent abroad in Vietnam, Japan and South Korea allows him to draw on those experiences and use them in the dishes he prepares. In 2012, Jordan decided to leap into Ontario’s wine country in Niagara, moving to the Queen’s Landing Hotel where he focused on event and wedding cuisine. Since 2013 he has been proudly leading the culinary team at the Garrison House. Jordan has a passion for showcasing Niagara’s bounty by cooking simple, honest food and sourcing local, quality ingredients.